North-East Wales Bird Report 2009. 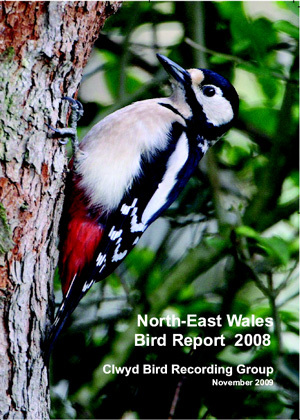 The North-East Wales Bird Report 2008 is now available and can be purchased for £5.00 from the RSPB Reserves at Inner Marsh Farm and Conwy. If you wish to receive it by post details can be read on the Clwyd Bird Recording Group website (www.cbrg.org.uk), click on the 'Reports' link. You can also view sample pages from the report on this website. This is a must read for all those with an interest in North-East Wales birds, this is the area which used to be called Clwyd and is now Flintshire and Denbighshire. There is an extensive Systematic List detailing the birds seen in 2008, including many tables, maps and graphs. There are 22 very good colour photographs including a splendid photo of a Great Spotted Woodpecker on the front cover (left) taken by Barry Barnacal. As usual there are some fascinating articles including a description of 'Gors Maen Llywd' by Adrian Lloyd-Jones, this is the largest reserve managed by the North Wales Wildlife Trust. Anne Brenchley describes the progress of the North Wales Breeding Bird Atlas 2008-2011, there is still plenty of work to be done on this project - see www.northwalesbirdatlas.co.uk. The Ringing Report contains details of 26 birds including two colour-ringed Black-tailed Godwits, both ringed in Iceland. The remains of a Hen Harrier, which was ringed as a chick in North-East Wales, were found in Lancashire near an Eagle Owl nest! Stuart Thomas writes about Wintering Blackcaps in North-East Wales, many of which he has ringed in his garden. Reports like this could not exist without people sending in their records. Now that the end of 2009 is rapidly approaching I would like to ask people to please send in their 2009 records for North-East Wales to the Clwyd Bird Recording Group - for details see www.cbrg.org.uk, many thanks. Any record, whether it be a rare, scarce or common species, will be gratefully received. 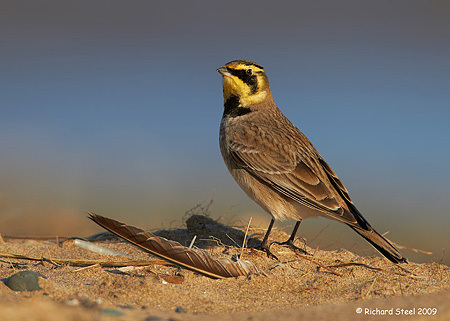 Two Shorelarks were the birds of the month, they were on the beach at Point of Ayr from 15th to 20th. These were the first birds in our area since 2004 when there were two at Gronant. In the winter of 98/99 there was a flock of 20 there! Six Snow buntings were at Point of Ayr over the same period, three were also briefly on the beach at Thurstaston on the 20th then a single on Little Eye to the end of the month. A Shorelark at Point of Ayr, Nov 16th © Richard Steel. Most years we are lucky to see just one or two Gannets in November, this year we had 23 on the 13th then birds were present until the month-end. Despite prolonged and strong southerly wind the only petrel this month was a Leach's on the 2nd off Leasowe. Wind-blown birds did include a Little Auk off Hilbre on the 24th, 22 Shag on West Kirby Marine Lake on the 20th was one of the highest ever count for this species in our area and appeared after an overnight gale. Perhaps less welcome by some (!) will have been the count of 2,478 Cormorant seen from Hilbre on the 24th, almost double the previous Cheshire and Wirral record of 1,280 on Jan 8th 2008. There were high counts all month including 770 on Little Eye, leaving no room for the usual Oystercatchers which all moved to Middle Eye. Off Hilbre there were two Slavonian Grebes and a Black-throated Diver on the 6th. 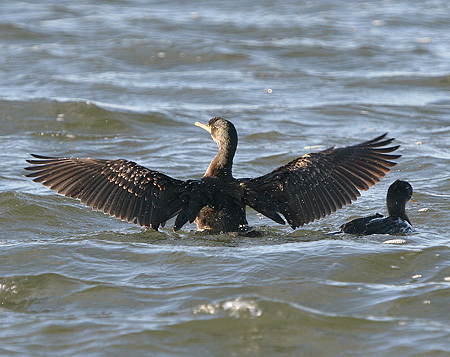 Two Shag on West Kirby Marine Lake on Nov 26th © Steve Seal. Brent Geese reached 121 on the 27th, these were all pale-bellied and included two ringed birds. Despite the mild weather there were some high counts of Knot including 26,000 on Hoylake Shore on the 14th and at least 18,000 at Heswall on the 20th. Numbers of Pintail loafing in the gutter at Thurstaston rapidly built up through the month, peaking at 960 on the 27th. Many thanks go to Chris Butterworth, Stephen Hinde, Steve Williams, Paul Vautrinot, Dave Edwards, Dave Harrington, Andy Thomas, Paul Brady, Charles Farnell, Steve Round, Jeremy Bradshaw, Robert Dillon, Steve Daies, Peter Welch, David Haigh, Bruce Atherton, Colin Wells, Henry Hill, Sheila Blamire, Jon Greep, Tom Giles, Kevin Smith, Paul Mason, Steve Seal, Henry Cook, Richard Steel, Sian O'Hara, Dave Wild, Elizabeth Maddocks, Rob Bithell, Andy Coxon, Mark Murphy, Alan Hitchmough, Martin Kelly, Stuart Thomas, Matt Thomas, Chris Wilding, Ian Campbell, Derek Gifford, Colin Davies, Keith Scovell, Mike Nesbit, Mike Davenport, Rob Jones, the Dee Estuary Wardens and the Hilbre Bird Observatory for their sightings during November. All sightings are gratefully received. As I write this at the end of November there is no indication that this winter, unlike the last one, is going to be good for Waxwings - but you never know and if they are going to arrive then December is when we will first see them. Brent geese numbers will increase, they already reached a max of 121 in Nov and I would expect at least 150 by the end of this month. Hilbre at low tide is a good place to see these, otherwise look for them from West Kirby shore at high tide; they are usually around Little Eye and sometimes on the shore at West Kirby itself, or on Bird Rock. Pintail and Teal numbers should increase at Heswall and Thurstaston, the sizeable flock which loaf in the gutter at low tide is probably the best site in the estuary to see these elegant ducks - particularly when they float off with the incoming tide. Flint Castle is also an excellent place to see several species duck, although they can be a bit distant across the channel. If the weather turns colder we should get an influx of waders, particularly Knot. At low tide large flocks of these can often be seen feeding close to the beach at Thurstaston, along with several hundred Black-tailed Godwits. Some spectacular numbers can also be seen at Hoylake, Point of Ayr and West Kirby at high tide, along with Dunlin, Grey Plover and Sanderling. It is always worth a visit to Parkgate in the late afternoon to see the Hen Harrier's coming to roost, you should also see Short-eared and Barn Owls. 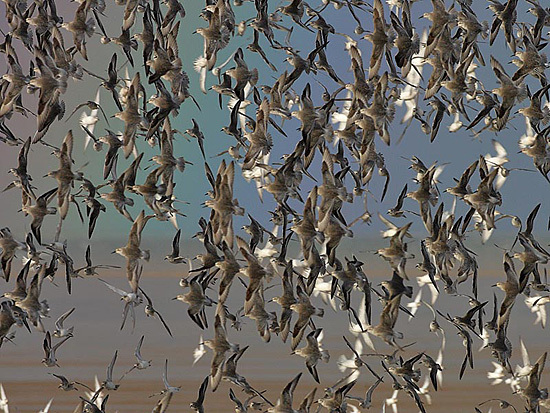 A flock of Knot at Hoylake taken against a rainbow, Nov 16th © Steve Round. 4th December, 12.15hrs (GMT), 9.5m. 5th December, 13.03hrs (GMT), 9.5m. Friday 4th December, 9am start, Mud’n’Marsh. Saturday 5th December. 10:30 am start. Hoylake Shore Birdwatch. 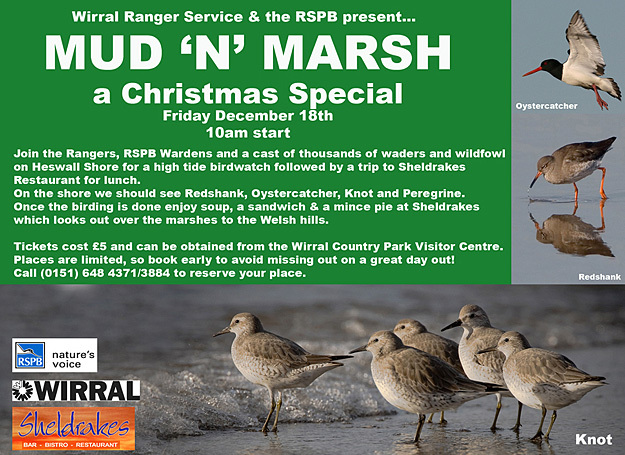 Join the Rangers, the Dee Estuary Voluntary Wardens and the RSPB to see the large numbers of wading birds on Hoylake beach. With a rising tide, we should see the birds at close quarters as they roost and feed. Beginners welcome. Dress warmly and bring binoculars if you have them. (HW 12:33 pm @ 9.5m). Sunday 13th December 2.30pm - Raptor Watch at the Old Baths Car Park, Parkgate. Last year was a record year for numbers of short-eared owls and hen harriers, other raptors included marsh harrier, kestrel, merlin, peregrine, buzzard, sparrowhawk and barn owl! Join RSPB staff and volunteers to find out all about the areas brilliant birds of prey. Meet at the Old Baths Car Park, Parkgate, starts 2.30pm. For further details ring 0151 336 7681. Friday 1st January, 9am start, 2010 Bird List. Join the Rangers on a birdwatch on Thurstaston Shore, through farmland and along the hedgerows of the Wirral Way to start Wirral Country Park’s 2010 year list. No need to book, meet at the Visitor Centre, Thurstaston. Sunday 3rd January, 11am start, Marsh Matters – High tide at Riverbank Road, Heswall. Join the Rangers and RSPB Wardens at Riverbank Road car park to watch thousands of birds gathering to roost in the marsh as the tide covers the mudflats of the Dee Estuary. This activity may bring out some hunting raptors. (High tide: 9.8m) Meet at Riverbank Road car park, Lower Heswall. Sunday 10th January, 2.30pm start, Raptor Watch at the Old Baths Car Park, Parkgate. Last year was a record year for numbers of Short-eared Owls and Hen Harriers, other raptors included Marsh Harrier, Kestrel, Merlin, Peregrine, Buzzard, Sparrowhawk and Barn Owl! Join RSPB staff and volunteers to find out about these brilliant birds of prey. Meet at Old Baths Car Park, Parkgate. Friday 15th, 9am start, Glorious Mud. There are thousands of waders feeding on the rich mudflats off Thurstaston Shore and numbers of Pintail are starting to build up. Join the Rangers on a birdwatch along this fabulous stretch of beach to get close up views of these special birds. No need to book, meet at the Visitor Centre, Thurstaston. Saturday 30th January and Sunday 31st January. Big Garden Birdwatch. This is a family event held at Ness Botanic Gardens 10am - 4pm (with a guided walk of the gardens 11am and 2pm). There will be a chance for the kids to make a bird feeder, enter a prize draw competition, and watch the birds visiting the feeders - last years birds included crossbills, siskin, nuthatch, goldcrest and great spotted woodpecker. Please ring 0151 353 0123 for details.